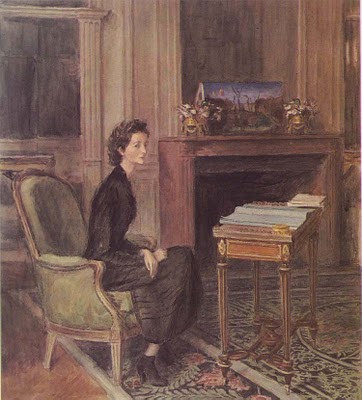 Today is Nancy Mitford's birthday. Recently her novels were reprinted and in keeping with modern technology, Nancy Mitford who has been dead nearly forty years, now has her own web site. Yes Virginia, there is a www.nancymitford.com. Here in West Virginia we find ourselves in the throes of a cold climate. It is hunting season and I have a ton of housework to do. So what does Nancy have to say about these things? "I think housework is far more tiring and frightening than hunting is, no comparison, and yet after hunting we had eggs for tea and were made to rest for hours, but after housework people expect one to go on just as if nothing special had happened." Indeed, well I think I shall do neither. I am going to brew some tea and sit and read some of Nancy Mitford's letters. Happy Birthday Nancy! Goodness, what a wonderful quote. Love the portrait too. If I were closer I'd have a cup with you my Dear.